LAST Monday, a news article on The Brunei Times on the closure of the Tamu Kianggeh caused a furore among vendors as well as regular visitors to the tamu. Some vendors expressed their grievances on the idea of losing the tamu, which for most of them, have been an integral part of their lives. Some were shocked and some were frustrated as most have inherited their stalls from their parents and grandparents and that it is a part of their heritage. Although some vendors agreed that even though visitors to the tamu have decreased over the years, they argued that it remains as one of the most visited locations in Brunei. Another reason for the furore was that the replacement new Tamu Gadong was not suitable for them with some vendors incapable of going to Tamu Gadong and were unwilling to abandon their livelihood at Kianggeh. It was argued that it was difficult to use boats to go to Gadong as low tides can hinder the boats from reaching the area and that the load of produce that they have to carry day in and day out to Gadong would also prove to be a burden. Meanwhile a number of commentators also pointed that if Tamu Kianggeh is to be closed down, then the capital will become less lively and that Brunei will lose a big part of its identity. The Tamu is considered as a national heritage and that it has been there for years and that it is one of the oldest market in the country. While it is true that the people of Brunei have always relied on commercial activities to support their lives, the argument that Tamu Kianggeh has always been there is unfortunately, not accurate. This writer can still clearly remembered the times when Tamu Kianggeh had not yet operated. In the days when Brunei was not on dry land, its ‘tamu’ functions were carried out on the Brunei River. Antonio Pigafetta, the Italian chronicler of Ferdinand Magellan’s fleet that made a stop in Brunei in July 1521, described scenes with women going around selling their wares on their small boats. In fact, as late as the early 1980s, every early day along the Brunei River, a visitor to Brunei can see a number of small Brunei sampans called ‘bidars’ rowed by women vendors with their ‘siraung’ or extra large circular hats moving up and down the houses along Kampong Ayer. Some of them also plied their wares along the jetties near the capital, Bandar Seri Begawan. These women vendors were known as ‘Padians’. In the Syair Awang Semaun, Brunei’s contemporary epic poetic legends, it was said it was Pateh Berbai who initiated the idea of a floating market selling all sorts of foodstuffs, vegetables and commodities. By the 1980s, the padians were already a dying breed and today, the padians have become completely extinct. It was the result of government’s policy going as far back as in 1906, when the government opened up dry land and encouraged many Kampong Ayer residents to migrate to the interior parts. The development of the dry land and the capital brought about the existence of markets and ‘tamus’ or smaller markets. Over time, the padians failed to continue serving as the centre of trade as the markets on dry land developed, as they were were generally small-time vendors making a living from the ‘pengalus’. Pengalus were middlemen and were generally men who paddled to the interior villages and buying and bringing goods to the market. However by the turn of the 20th century, many of the suppliers brought their wares directly to the markets without going through the padians or the pengalus. It is hard to say where the first market on land developed in Brunei. 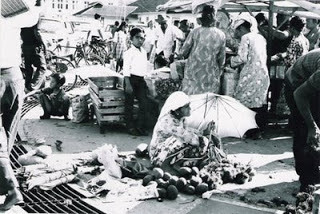 By the turn of the twentieth century, an old photograph depicted a group of padian by the riverbank at the ‘labuhan kapal’ (today it is the site of Bandar Seri Begawan wharf, now known as the Royal Wharf) was probably among the first modern market where customers on dry land can buy their goods from the padians. The first identifiable modern tamu in the 1950s and 1960s was the triangular area in front of the Yayasan Sultan Haji Hassanal Bolkiah Building and behind the building called the ‘Jardine Wharf’ Building. That area also housed a fruit and vegetable market. Many vendors congregate to the area to sell their vegetables, live stocks, fruits and the Brunei traditional cakes and biscuits. Haji Wahab Tuah remembered how he used to be carried by his father very early in the morning so as to get a place to sell the family’s vegetables and traditional Brunei food. Haji Wahab would find himself waking up amidst the very busy crowd. It never had a proper name other than being called a ‘tamu’. It is possible that the word ‘tamu’ is derived from the standard Malay word ‘temu’ which means ‘to meet’. This tamu expanded and by the early 1970s, it had spread out to the area in front of the Jardine Wharf Building which is today’s Taman Sultan Haji Omar Ali Saifuddien. In the 1970s, the Taman was only a plain open field with no grandstands. Many vendors set up their stalls along this field. 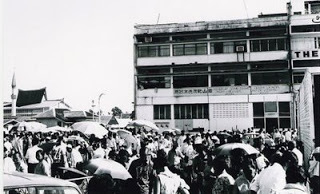 The area facing the mosque, in front of the police station (now demolished and made into a carpark) specialised in selling clothing articles and also other knick knacks, whereas the area facing the building sells food and related products. Haji Noorhadi Noorkaseh used to help his parents sell their products in this tamu. According to him, by then the triangular area was no longer used as a tamu. One also has to remember that the Yayasan Building was only completed in the early 1990s, and before that, the shops and houses of Kampong Sultan Lama was right on the street of Jalan Residency connecting to Jalan Stoney. It was a very busy area and traffic jams were commonplace during Fridays and Sundays. By the 1980s, preparations were being made for Brunei's Independence which was on the eve of 1 January 1984. Grandstands had to be built. The Brunei Police Station was demolished and was rebuilt at where it is today. The field was cleared and being turned into today’s Taman Sultan Haji Omar Ali Saifuddien. The vendors at the tamu were moved out and were given a temporary space at Batu Satu, JalanTutong. There was an open area near a department store called Klasse Jaya which has now been demolished. In the meantime preparations were being made to turn a small open area across the Kianggeh river into today’s Tamu Kianggeh. By that time, there were already many sellers along the Kianggeh River selling goods and supplies required by the city’s inhabitants from their boats. It was around the mid 1980s that the Kianggeh Tamu was finally opened. And what if the Kianggeh Tamu has to close tomorrow? Would Bandar Seri Begawan lose its heritage? While this writer is a passionate supporter of Brunei’s heritage, this writer believes that wherever the tamu is going to be located, it will bring with it, its characteristics and its attractions. The location at Kianggeh has never been historical given its recent history, and any other location would be just as similar to Kianggeh. The same argument for and against was mooted when the wet market had to be relocated from Bandar to Gadong years ago. There will obviously be losers such as the vendors who had been there. Visitors to Central Bandar Seri Begawan would lose one more spot to visit. The gain will be for vendors and visitors at Gadong which is still a part of Bandar Seri Begawan.